10 STUDENT HANDBOOK and servicing agency for all University printing and publishing; all printing which is paid by funds administered by the University must be approved by the Publications Department. The Printing Service of the department is equipped to do both letterpress and offset printing, as well as Xerox, mimeographing, and Ozalid copying and binding. The department also offers consultation on all matters dealing with editing, design and publication. These services are available by requisition-order to recognized student organizations. The department is located in Close Hall. Office of Public Information and University News Service These units serve to foster a greater understanding of the University's goals and activities. The News Service tells the on-going story by providing news releases to the mass media. Its Campus News Bureau, at 3 East Market, offers assistance to student groups in publicizing campus events. 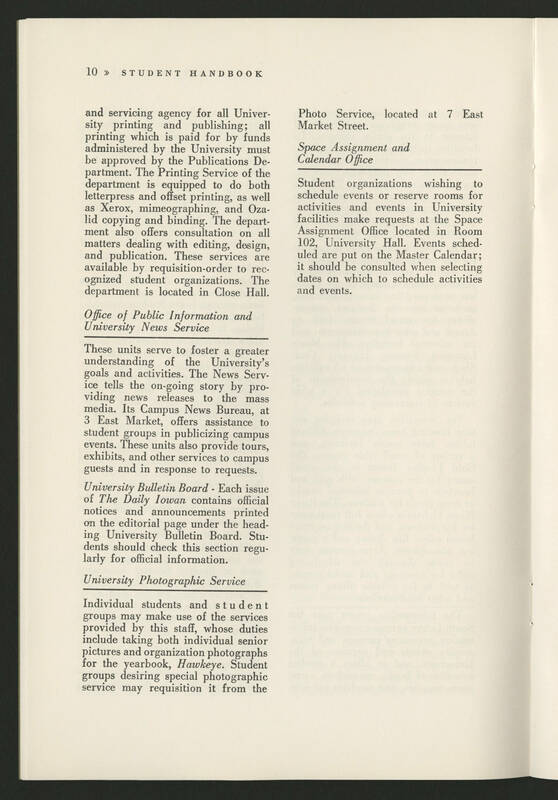 These units also provide tours, exhibits and other services to campus guests and in response to requests University Bulletin Board - Each issue of The Daily Iowan contains official notices and announcements printed on the editorial page under the heading University Bulletin Board. Students should check this section regularly for official information. University Photographic Service Individual students and student groups may make use of the services provided by this staff, whose duties include taking both individual senior pictures and organization photographs for the yearbook, Hawkeye. Student groups desiring special photographic service may requisition it from the Photo Service, located at 7 East Market Street. Space Assignment and Calendar Office Student organizations wishing to schedule events or reserve rooms for activities and events in University facilities make requests at the Space Assignment Office located in Room 102, University Hall. Events scheduled are put on the Master Calendar; it should be consulted when selecting dates on which to schedule activities and events.